The traditional and modern anniversary gifts for the 20th wedding anniversary are as alike as they are unalike. On the one hand, we have the modern gift of platinum. And on the other, the traditional gift of fine china. Platinum is a tough metal and one of the purest. Most platinum jewelry is composed of around 95 percent pure platinum. Compare this to gold, which at 14 karats is only composed of 58.3 percent pure gold. This gray metal is masculine and it can symbolize strength and endurance. Platinum is also rare, doesn’t tarnish and is inherently valuable. Fine china is delicate, feminine and is often reminiscent of dinner parties and social gatherings. As a 20th anniversary gift, it reminds couples of the importance of always connecting with friends and family. Authentic fine china is composed of white porcelain and can also symbolize longevity and durability. Both platinum and fine china can last decades without so much as a scratch, but they can also be extremely fragile with incorrect care. Drop fine china to the ground, and it can shatter into hundreds of pieces. A lesser known fact is that if you hit a platinum ring against a hard surface, it can break. Though platinum has more strength than fine china, it can crack, chip or shatter as opposed to gold that mostly just bends. Once broken, neither the platinum nor China are nearly as strong. In most cases, they break beyond repair. These gifts were chosen as an analogy for marriage. After twenty years, it’s easy to coast along and think things are fine with minimal effort. But remember, marriage is always vulnerable. Though a healthy 20-year marriage can be resilient and last a lifetime with the right attention, it too can break beyond repair. Take heed and take care. These 20th-anniversary gift ideas combine some clever ways to incorporate the modern and traditional gifts. There are also some bonus gift ideas including the anniversary’s official flower and gemstone. 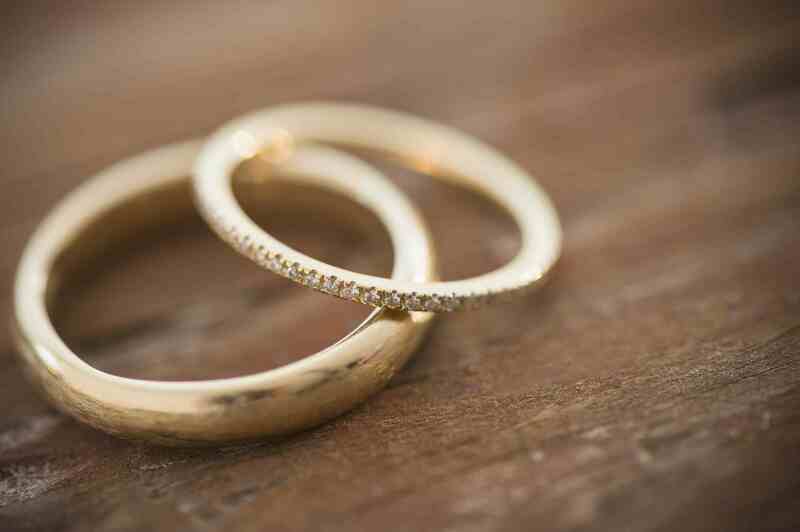 Jewelry is a wear item, so it’s to be expected that your wedding bands won’t be in tip-top shape after twenty years. Take this opportunity to treat each other to a new set. Get them matching, have them engraved and use platinum if you can afford it. Day lilies are a flirtatious flower and the official marker of the 20th anniversary. They symbolize young love and playfulness. The other flower of this anniversary is Aster, which symbolizes patience and wisdom. On such a milestone anniversary, it makes sense that the official gemstone is one of the oldest and most historic. Emerald’s green hue symbolizes growth and healing. Emeralds are thought to have one of the most calming colors and staring into the gem is believed to rest the eyes and mind. Perhaps on days when your marriage is particularly challenging, a beautiful emerald can offer a much-needed respite. Most wedding registries have some china on their list. If you’re like most couples, this china sits in a cabinet only to be used on “special occasions.” For the 20th anniversary, take that china out of the cabinet and assess what you have. Are there pieces you need to make a complete set? Is the pattern dated and you both agree a new set would be used more often? Whatever you need to do or buy to make your china more usable, do it. Then, throw a dinner party to celebrate and make it a point to plan more occasions where you will use your china. Get a platinum credit card that offers great travel rewards. Use the card as your “date night” and “experiences” card and make it a point to plan outings as a couple that will strengthen your marriage. As a bonus, everything you spend will gain you rewards points that can go toward a future vacation together. Invest in your marriage and you won't regret it.